Spin It. Stroll It. Soar It. Important Info: Motorcyclists welcome. Courtesy cars are available upon arrival at the park. Conveniently located on historic Route 66 in Northern Arizona, just an hour south of the Grand Canyon National Park, Bearizona is nestled amongst the Kaibab National Forest. 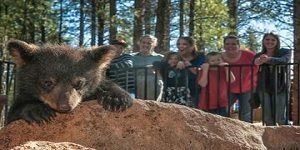 Visitors will be able to drive through more than 3 miles of the Ponderosa Pine Forest, over 160 acres of the animial’s natural habitats. More animals are living in Fort Bearizona, a 20-acre walk-thru area with winding pathways set up similar to a zoo. From the comfort and safety of your own vehicle, self-drive through Bearizona and enjoy views of the American Black Bear, Sheep, American Bison, a variety of Deer, Elk and Goats and so much more! This varied collection of North American animals is untamed – do not feed the animals. Bearizona accommodates most modes of transportation, including cars, RVs and motorcycles. If you do arrive on open-wheel, Bearizona will provide you with a courtesy car, free of charge! Adventurous guests who want to feel the wind in their hair and experience views of the park’s wildlife without any obstructed views can take a ride on the Wild Ride VIP Bus Tour which departs from the Fort Bearizona parking lot at several times throughout the day. This is just $5 more per adult (13+) at the park. 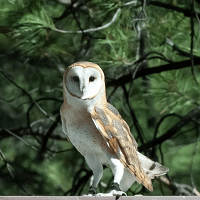 Included in each ticket purchase is access to the Birds of Prey show, located at Fort Bearizona. There are 3 scheduled flight shows daily (March-December) and visitors will see hawks, owls, falcons and other raptors. Between January-February, these shows are weekends only. After purchase, you will receive an email receipt confirming your reservation. An additional confirmation email will follow with your voucher for Bearizona. Guests must print and present this voucher upon arrival at the park in order to gain entry. No credit or refund will be due for guests who do not present their voucher at the park. If you have any questions, please call our friendly Travel Concierge at 844-868-7392. Please note: Bearizona is located 30 minutes west of Flagstaff, 1 hour south of the Grand Canyon South Rim and 3 hours southeast of Las Vegas. Transportation to the park is not provided. Bearizona opens daily at 9am with the last car entry at 4pm. The park closes at dusk with closing time varying throughout the year. Other notable times include Bobcat feedings at 10:40am and Otter feedings at 11:40am. The Wild Ride Bus Tour departure times vary slightly throughout the year but are generally near 10am, 12pm, 2pm and 3:30pm.